Introducing - the SAAGNY Job Board! As an exclusive benefit to SAAGNY members, we are pleased to announce a new resource for employers and job seekers alike. Have an opening in your company? Post it here! The SAAGNY Job Board helps companies of all sizes hire talented job seekers. It is an effective opportunity to share news of your opening with the entire SAAGNY membership. Why post your job on the SAAGNY Job Board? This is your local trade association – YOUR local solution to the Promotional Product Industry. And there is one big reason that we hope everyone can appreciate - it is another SAAGNY Member Benefit. Are you a job seeker? Please check this job board often for new job announcements. The SAAGNY Job Board is in the members only section of the website. Just sign in (look for the icon in the right hand corner of your screen) at saagny.org. Are you an employer? Please consider posting your job announcement on the SAAGNY Job Board. Inquiries please email info@saagny.org. Vote for the Winner Today! It is that time of year to vote for the winners of the SAAGNY awards. Are you a SAAGNY member, then you were emailed the link to choose the winner. Winners will be announced at the Holiday Party, Wednesday, December 12, Glen Island Harbour Club. Were YOU at the SAAGNY Fall Show? 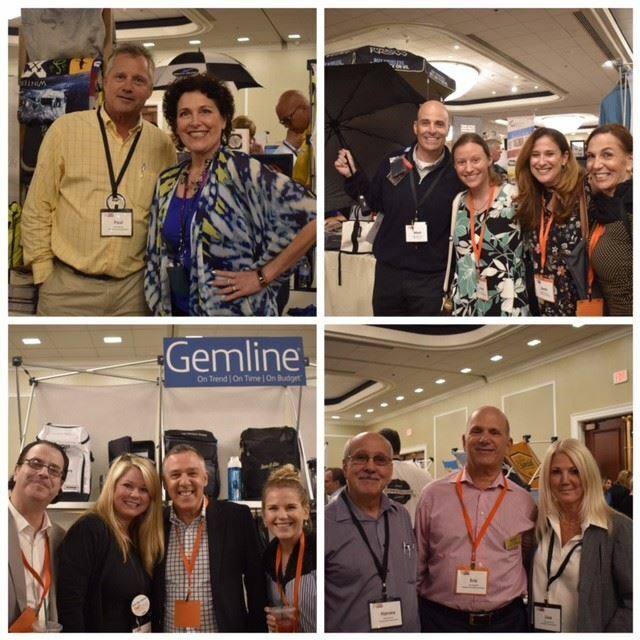 If you were not at Wednesday's SAAGNY Fall Showcase you should have been! 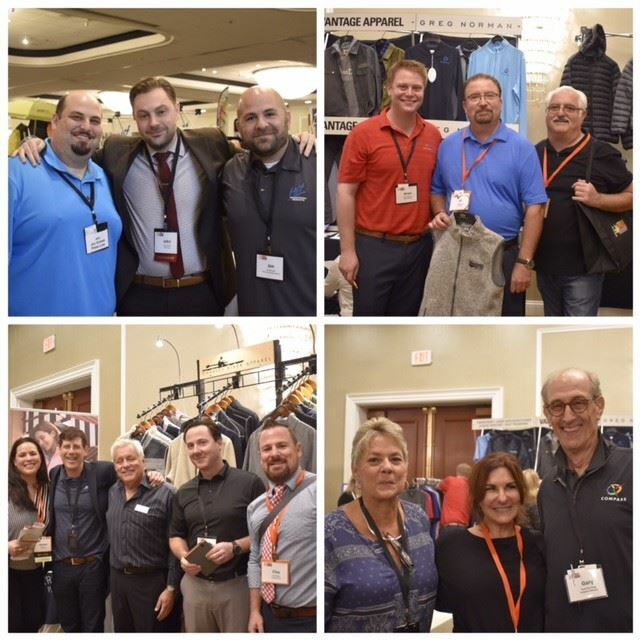 SAAGNY held its Annual Fall Showcase this past Wednesday at the Teaneck Marriott at Glenpointe, Teaneck, NJ. This year's show included more than 100 supplier and multi-line representative companies and a record number of distributor attendees. The day began with an Education Program featuring Damon Subasa, The Proinnovative Line, discussing "Cannabis and the Promotional Product Industry". 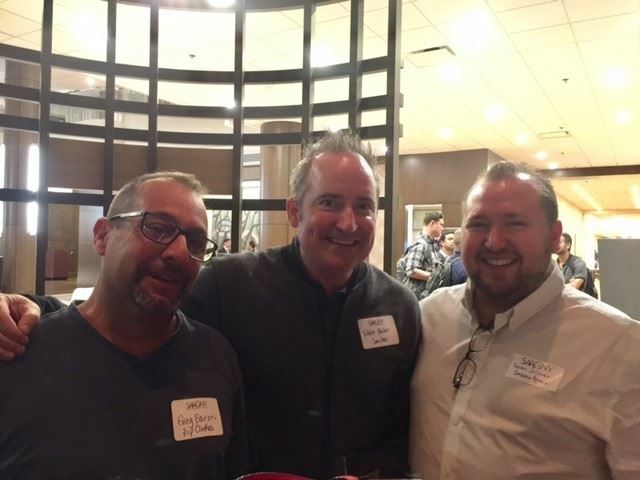 The "Night Before the Show" included a Meet N' Greet networking reception at the Pancetta Bar where suppliers and distributors were able to mix and mingle in a relaxed atmosphere. Thank you to everyone who made these events a huge success! Gail Deutchman - Gail has served on SAAGNY Board of Directors for 15 years, The SAAGNY Foundation Board for 5 years, and numerous SAAGNY committees. Gail solicited product donations from industry suppliers used for Happiness is Camping and Foundation events; sold tickets at events to raise money for the Foundation increasing the amount collected year over year; set up the Fall Show for 10 years; set up the Foundation Chinese Auction. Gail is always willing to assist SAAGNY and the Foundation with projects to this day. Gail volunteers in her community- President of the Hebrew school PTA; at her Synagogue spearheading collections of clothing and other items for tragedy victims and hard-hit communities; fundraising at her Synagogue including the Fashion Show and Silent Auction; cares for the elderly including shopping for them and companionship. Gail is always willing to help her fellow Distributors with issues with vendors and “where do I get this product.” They are her competitors but always takes the time to assist in solving a problem for them and brainstorming solutions for their issues. Ian is on the Essex County Mental Health Board. He has been spearheading a drive to get one main routing number for anyone with mental health issues So, one would call a main number, then through a series of prompts be routed to a person who specializes in the issues that one is seeking help. That will include things like Suicide hot line, PTST, cops to cops, Alzheimer’s help line and the full spectrum of mental health issues. You will only need one phone number to find help. The last prompt will get you to a crises center. Ian is on the board of Tender Loving Totes. TLT give out tote bags full with products to help homeless people. With the participation of vendors like Superbag, we supply some of the products and bags for this very worthy charity. The bags are filled with things like shampoo, soap socks, gloves and hats as well as water and a book. Ian is involved in peer counseling for people who are dealing with family members who are suffering from Dementia and Alzheimer’s supplying resources, and a person to speak with who has been there. Ian is working with the Essex County jails to determine what if any part Literacy is affecting the inmate population, If a determination is made that there is a cause/effect relationship ( study is currently underway) then programs will be put in place to help address the problem. Shari Verrone - I’m very honored to be nominated for this year’s SAAGNY Humanitarian of the Year Award. Helping those within my community and industry has always been a rewarding experience for me. Personally, I volunteer working with senior citizens by being a companion and playing cards with them. I also volunteer and visit an elderly woman when her family is not available so she is not lonely. I am in the final stage of becoming a ‘buddy’ who I will meet with once a month from a local homeless shelter to be a role model and confidant. I had the fortunate opportunity to volunteer at a camp once specializing in helping kids with cancer as well. I encourage my staff to volunteer within the community or at an organization that has meaning to them by offering them a paid day to spend volunteering once a month in the summer months. I’m also initiating an internal self-development program called Stackable Sensations University. Each employee, in order to graduate, will be required to take a language course (Rosetta Stone), LinkedIn courses, Health and Wellness program and read a book and give an oral presentation of their choice to name a few of their classes. I do my best to give wherever I can. Monetarily or donations to Disability Matters, Cardinal McCloskey Community Services, JDRF-Diabetes, Make a Wish Foundation as well as local schools and sports teams. Last year during the hurricane that devastated Houston I took a supplier on a shopping trip for new clothes that had lost everything. Many of our larger clients are also ramping up diversity and inclusion clubs and I connect clients that can learn from each other to help everyone achieve their goals. Within the industry I am an active mentor in Promo Kitchen plus mentor two other distributors (Florida and Canada) helping them with creativity and strategizing. I have been a speaker at the WPEO (Women Presidents’ Educational Organization) meeting in NYC to help businesses get to the next level. We have outlined a section of our new website coming out shortly dedicated to “helping connect” people with resources or contacts they are looking to meet that can help grow their business. Recently I was in Florida seeing a client and after my meeting I met up with my Florida mentees, who are newer to the industry, looking for some guidance on their processes and projects. It was a very productive afternoon for all of us and something I wish I would have been able to have when I started in the industry. Thank you for this nomination. Every year I’m grateful for being a SAAGNY member and relationships that have come out of it. The United States Postal Service (USPS) has issued a notice of proposed rulemaking regarding new mailing limitations for marketing mail. The proposed change would limit marketing mail to content that is paper-based or printed matter. No products of any type would be allowed, regardless of the item's value. If approved, this new rule would eliminate magnets, buttons and a variety of other items often included in marketing mailers. Any object that cannot be sent as a letter size or flat piece would not qualify for mailing via USPS marketing mail and sending would require using another method such as Parcel Select or Priority Mail. A wide variety of organizations including small businesses and nonprofits would be deeply harmed by this proposed limitation to the USPS mailing standards. Please reach out to the USPS manager for product classification at ProductClassification@usps.gov , and use the subject line "USPS Marketing Mail Content Eligibility" to share your concerns about this proposed rule. To use a pre-written letter via the PPAI Law website, please click here. If Price Increases of 25% or more will hurt your business, tell them about it. PPAI has joined 21 other trade associations to participate in the public commenting period related to the Section 301 tariff proposals. The commenting period expired September 6 and allowed interested parties to respond to the third tranche of import tariffs under the United States Trade Representative's (USTR) Section 301 investigation. The commenting period also requested feedback regarding the proposed rate increase from 10 to 25 percent. The letter noted the U.S. already imposes tariffs on the items outlined in the tariff list, including baseball hats, backpacks and a wide variety of other consumer products. The letter also pointed out how the tariff increases would raise prices for American consumers and threaten U.S. jobs in the process. PPAI is on the record opposing any tariff proposals. Due to the rise in consumer prices that results when tariffs are applied to products, tariffs are effectively a tax on consumers. PPAI LAW has a series of pre-populated letters that can be sent to local members of Congress. Click here to inform your elected officials about the negative impact tariffs would have on the promotional products industry. SAAGNY Award Season Has Arrived! Check your email for your copy of the survey to nominate your favorite SAAGNY members. For a list of SAAGNY distributor members click here. For a list of SAAGNY supplier, MLRs, and Business Service members click here. Do you know a SAAGNY Rising Star - an up-and-coming professional in the promotional product industry? These individuals bring new ideas, dedication, and enthusiasm to both their company and the industry. The Honorees will be recognized by their peers, receive a beautiful award, and a complimentary registration to PPAI SPARK. Click here to review the requirements and application. How about showcasing your creative excellence? The SAAGNY Diamond Awards were created to recognize and showcase the creative excellence of SAAGNY members. It is YOUR opportunity to spotlight your best work. Click here to review the requirements and application. Do you want to attend a PPAI conference in 2019 - consider applying for the Linda Robinson Leadership Award or the Past Presidents' Continuing Education Award. It is time to make YOU a priority - click here for the requirements and application. Congratulations SAAGNY Member Tim Howe! Congratulations Tim Howe, Spectrum Designs, for being named a PPB 2018 Rising Star! Tim and nineteen other PPB 2018 Rising Stars were recognized at the opening dinner of the PPAI North American Leadership Conference at the Mandarin Oriental Hotel in Washington, D.C.
“There’s no better indication of our industry’s bright future than the bold attitudes and ambition of these inspiring individuals,” said PPB Editor Tina Berres Filipski, in her opening remarks about this year’s honorees. PPB’s Rising Stars is an annual recognition program that has sought out and spotlighted the industry’s young up-and-coming individuals since 2010. Those selected this year were among nearly 90 nominees recommended by their bosses, coworkers, clients or suppliers. Tim Howe also was the recipient of the SAAGNY 2018 Rising Star Award. Tim also was one of nine industry professionals that earned their Certified Advertising Specialist (CAS) designations this past July . Tim joins an elite group of individuals who have demonstrated their commitment to the promotional products industry and to continuing their education. The full article about PPB Rising Stars can be reached by clicking here. SAAGNY has partnered with the New York Jets in a "Corporate Huddle" to offer discounted tickets to our membership. Another great SAAGNY member benefit! Please visit jetsgroups.com/saagny to see the great offers on tickets for the 2018-2019 season. Go Jets!